A lot of players (or family members) don’t understand the difference between regular shoes and soccer shoes let alone indoor soccer shoes. 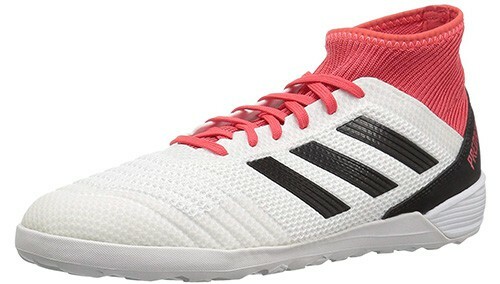 Let me tell you that they are quite different and there is a special type to get when looking for best indoor soccer shoes. Before coughing up cash to buy a pair that you are unsure of whether it is best for you or not, read the guide that we have compiled for you below. 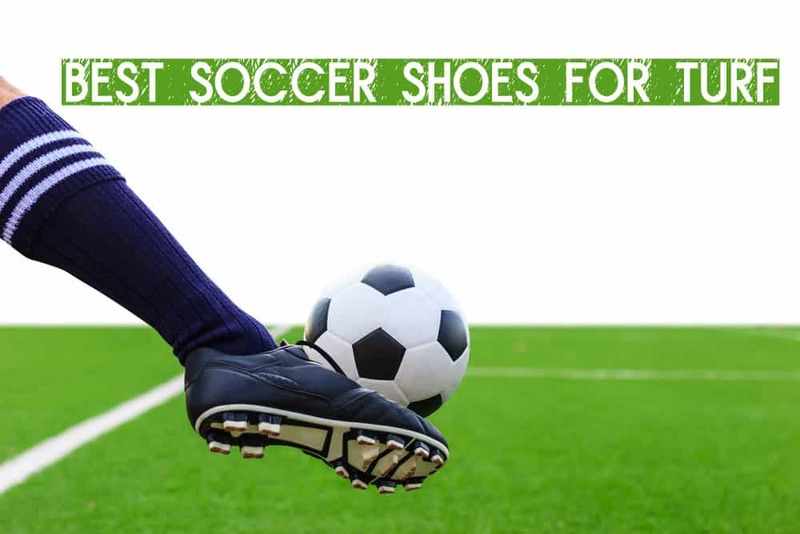 After reading this article, you will be able to understand the different materials, styles, and makes of indoor shoes, making you more equipped in purchasing the best turf shoes for the performance and style that you desire. Along with Adidas, Puma is one of the most iconic sports apparel brands in the world. They make amazing clothes and shoes, and these are a prime example of just what they can do. The shoes are not without faults, however, and their durability does leave something to be desired, but this seems to be more of an issue across different models than an inherent issue in the shoes themselves. So, without further ado, let us take a look in more detail at these puppies. They are low-top, imported, made up of a combination of textile and synthetic materials. They have rubber soles and are specifically made for soccer performance with the Netfit technology which they use in their construction. With these, you will be the king of the metaphorical field. One thing that is really striking about these shoes is the design. Customers report getting regular compliments on these, courtesy of their fluorescent colors, particularly the ones which are red. So if you are the kind of player that not only wishes to perform well but also to look good doing it, then these shoes are the shoes for you. Another good thing about these shoes is that they are incredibly versatile, and can be used quite comfortable for other indoor sports on hardwood floors such as racquetball. Customers report being very satisfied with how they perform outside the realm of indoor football. Now one of the biggest issues with these shoes is durability. Several customers have reported that the shoes did not last many games before the sole started falling apart, but as far as we could tell these were more isolated cases than something happening across the board. This means that buying these shoes is somewhat of a risk, but surely one worth taking when you consider how beautiful they look and how efficiently they perform. Give them a try. There is a high likelihood that you will not be disappointed. The number of people who were satisfied with these outweighs the number of those who disliked them. Next up, we have another pair of Adidas shoes, and this one with quite a bit of controversy around them. Some people love them and some hate them, and we will explore just why that is after we list the general features of the shoes. The shoes are made of a combination of leather and synthetic materials and are imported. They are low-top and have a rubber sole. That is really about all what needs to be said about their general construction, so we can move on to the controversy around them. Basically, the issue with them is that some people have reported how their durability leaves something to be desired. This would not be a problem had they not listed as an indoor football pair of shoes, because as a general sneaker they perform great. On the other hand, many others swear by them and say that they are, after all, a terrific pair of shoes, which might indicate that, just as with the Pumas we last talked about, the durability is an issue only with individual models, and not with all of the pairs. This points to inconsistency on Adidas’ part. However, one thing which simply cannot be overlooked or disputed is just how good these shoes look. Of course, aesthetics, particularly when it comes to fashion, are a matter of personal taste, but few people can deny that these shoes look dynamite. You will undoubtedly get a lot of compliments while wearing these, and the way they look on your feet will make you want to wear them more and more. That said, be sure to size up when buying, as customers have reported the models to be on the smaller side. If you do not like them, be sure to send them back quickly, as the time limit for returns is quite tight. All of that being said, these are a fairly okay pair of sneakers, esp. if you are not planning using them intensely. Adidas is a brand long known for the superior quality of its footwear. Their shoes have been hailed as some of the greatest in the history of sports. They sell shoes for all kinds of sports activities, from basketball to skating. These shoes, however, are meant for indoor soccer. This shoe hits on all the points that one needs to have a quality shoe for indoor soccer. It combines excellent traction and protection with superb levels of comfort and style. Not only will you be running circles around your opponents in no time with these, you will also look great doing it. The shoe is made of a combination of textiles and synthetic materials, along with a rubber sole. It is imported. The coated mesh allows for an enhanced sense of touch when wearing these shoes. The inside and the part around the ankle (which actually protrudes a bit out of the actual shoe) is a snug, sock-like material that will fit your foot like a second skin. You will be hard-pressed to find a sports sneaker half as comfortable as this one. The molded heel offers a snug feel which further enhances comfort, but more importantly, gives you snappier and more responsive movement so that your instinctual reactions are better performed. The control embossing on the upper allows you to handle the ball better, which is arguably the most important thing in a game of soccer. Although these shoes will not make you an expert player overnight, they will drastically improve your game by making the actions that you already know how to perform that much easier. This means that with less effort, you will be able to deliver much more efficient play both for yourself and your team. 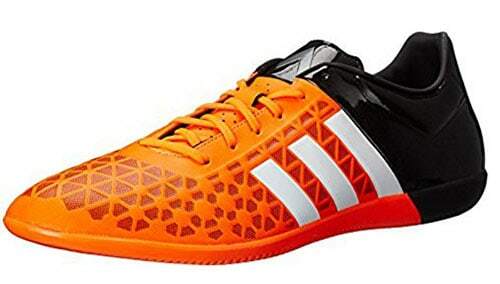 If you are a serious indoor soccer player, then it is really difficult to find a substitute for these, as they really are the perfect all-around effective shoe. Most definitely give these a try. You will not be disappointed. If what you are after is to dominate the pitch, you can only achieve such if you have the right pair of shoes.This is where Adidas Performance’s Messi 15.3 comes in. Having a pair of the Messi 15.3 will give you utmost precision when making a score, striking, and passing. You won’t even have to worry about the grip.This shoe comes with a special outsole to provide complete traction and control, whenever the user is on the pitch. The shoe’s rubber outsole is extremely lightweight to promote easy movements. The added stability is because of the shoe’s molded mid foot, heal piece, and X-ray upper. The non-marking outsole is the reason why the shoe can be used on a polished surface. 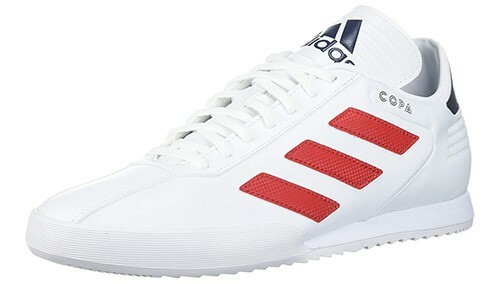 For all-round comfort, Adidas equipped the shoe with a lightly padded tongue and collar. 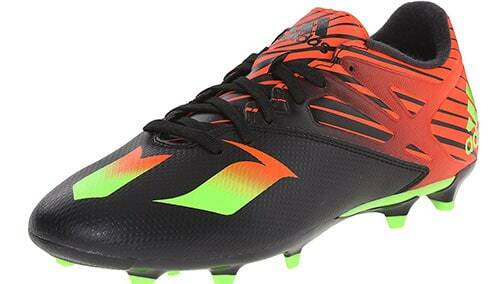 The Messi 15.3 is made with durable, synthetic materials, and it is super stylish, modern, and comfortable. The shoe, however, requires a week to break in. Once that’s over, the shoe will become very comfortable. You can rely on the shoe for comfortability for the entire duration of its lifespan. The shoe will adopt and contour to a foot well. A pair is lightweight and the fit is excellent. It is suitable for both turf and indoors. For those that have wider feet, it’s advised that bigger sizes are purchased to guarantee the greatest fit possible. 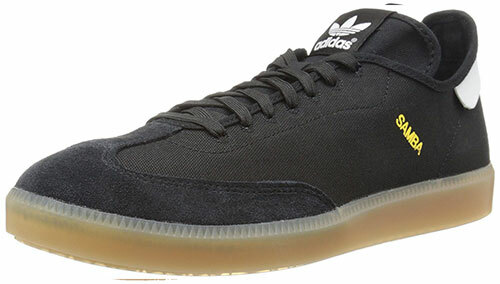 The Samba MC Lifestyle by Adidas features textile uppers and an extremely soft rubber outsole for comfort and breathability. It is a very good pair of shoes, and it is ideal for those who have wider feet because the front part is roomy. It also fits perfectly, and it is comfortable enough that you can use it with different outfits. Furthermore, it comes with an ortholite insole for additional arch support and comfort. Try getting a pair and you will find it to be spacious enough. It even allows you to place an additional insole if you prefer. Outdoors and indoors are perfect for the Samba MC Lifestyle. If you are on the hunt for excellent flexibility and great comfort, you will definitely love this one. No break in period is required for the Adidas Originals, and the T-toe overlay made of suede ensures that you can move your feet inside the shoe without any friction or abrasion. This pair of indoor soccer shoes made for men ensures that every skill and move on the field is executed perfectly by the user. Its synthetic leather upper offers durability and maximum support. Its snug molded fit allows the feet to remain warm and stable. A pair of X 15.4 comes with non-marking rubber outsoles, and its outsoles were designed in a way that they promote explosive speed. When looking at it up close, you will see that it was crafted carefully for an unmatched ground shredding traction and performance. It is perfect to use on a polished surface. Its colorful, lightweight skin makes sure that the user is on the spotlight. Its refined outsole ensures superior ball control. If you want a better fit for your X 15.4, you might want to order one size up of your normal size. To shatter expectations, you have to be lightning fast and this shoe will help you achieve your goal. The X 15.4 comes with a thinner sole that helps in boosting a player’s performance when making power shots at the goal of the opposing team. This is definitely an impressive pair of shoes. You can impress the audience with your game, and it is perfect when playing soccer indoors. It is even applicable for casual wear! The X 15.4 is breathable and comfortable, leaving you with fresh feet even after hours of playing. 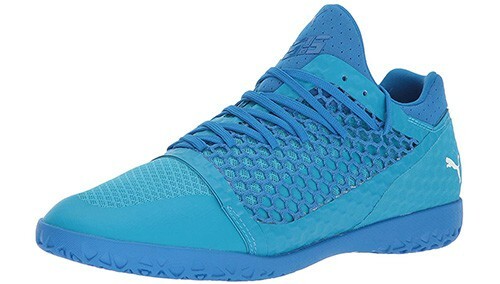 Upon first glance, people are unsure of what to think about this Puma shoe. Several days after you’ve bought a pair, you’ll realize how durable the shoes are that they can withstand kicks daily for years. Puma produced a line that’s perfect for indoor games and everyday footwear. Puma is an established brand and it maintains a good reputation in the industry. The company is also known for making high quality shoes. A pair of the Vulcanized Sala features a breathable mesh and synthetic leather uppers. 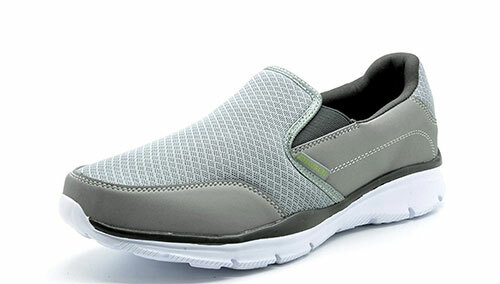 It is extremely comfortable and you can use it for outdoor strolls and soccer games. When you acquire a pair, you can wear it for longer periods of time because of the EVA midsole that’s cushioned. The cushioned midsole is also the reason why it has an incredible, comfortable fit. Its forefoot pivot point allows quick rotation, and it is good enough for practice games. The Vulcanized Sala has a non-marking rubber sole. It is an indoor pair of shoes, but it is still great on various surfaces. To sum it all up, it is an excellent shoe and it’s perfectly suited for everyday wear and indoor soccer games. This shoe is among the most sought after futsal shoes available on the market today. 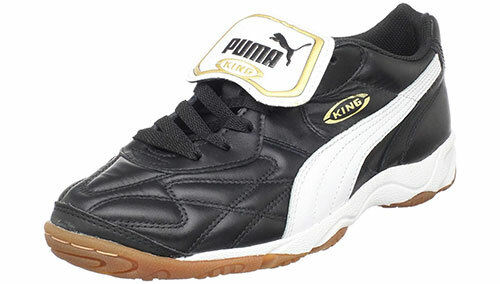 A pair of the Puma King IT features all-black uppers with flipped tongues that are prominently displayed (a trademark of Puma). 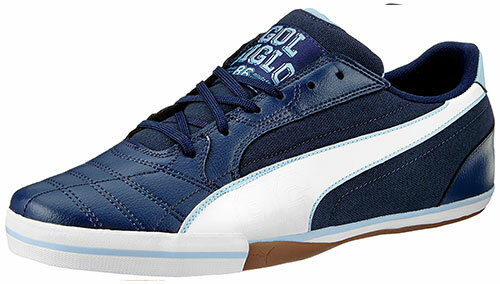 The upper is made of 100% leather, but it still maintains a soft feel when kicking or moving a soccer ball. Although it is already great as it is, it is still best to break it in for at least a day or two. From there, you’ll be able to experience smooth sailing with your Puma King IT. When you take a closer look, you’ll see that the Puma King exudes a high profile. The upper is somewhat stiff, but it can still be broken in down the road. At the heel, you will find that the sole is thicker. This was done intentionally by Puma so that the user absorbs shock better, especially when it is needed when practicing and playing on a hard indoor surface. Usually, an awkward landing on your heel is painful. This is the reason why Puma slightly raised the heel. As for the sole, it is firm and durable. Its sole establishes a solid barrier from the player to the hard surface. It does so without sacrificing the player’s sense of touch. The Puma King IT is built in a way that it can withstand daily beating. It’s sturdy, offering a solid touch. You can control and maneuver the ball easily with this shoe, and you can do so while playing on a hard surface. For players who want to stand out on an indoor tournament, the Ace 15.3 is perfect. 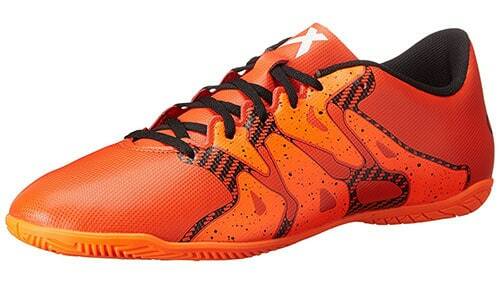 This indoor soccer shoe features a synthetic upper that’s combined with a beautiful two-color design. The design is undeniably stunning and it stands out. The Ace 15.3 has a lightweight molded synthetic upper and its tongue is thin. Rest assured, it will go easy on your instep. A pair of this can be used on turf and indoors as well. You’ll find it to be handy especially when you want to sneak a little outdoor game. With this, you won’t have to buy a new pair of soccer shoes altogether. However, you have to remember that the Ace 15.3 is designed mostly for indoor usage. Its lightweight synthetic upper conforms to a foot’s shape. As for the outsole, it was made to allow better traction on a polished surface. Its perforated tongue ensures breathability. The Ace 15.3 can be relied on if you want a pair of shoes that will give your performance on the field a boost. It is also great for players with wider sets of feet. Players would want to retain close contact with the ball and you can do so with this shoe. There will be no more embarrassing ball losses or slip ups if you have the Ace 15.3 on. You can get this shoe in several different bold patterns and colors. Choose the one that best suits your personal preference. All in all, it’s a good companion when playing indoor soccer. Dream Pairs has been crafted to provide better grip and control, regardless of the surface a player plays on. It is constructed with a supple upper that’s also lightweight. The shoe will ensure that the user moves around with ease. With the Dream Pairs, dodging opponents will be easier. The collar is padded and cushioned to allow extra support. A fold-over tongue on the other side is present to keep laces secure and flat. This means you will have a striking surface that’s ultimately clean. The outsole of the Dream Pairs is firm and it comes with a good tread pattern, ensuring a great traction when chasing the soccer ball at full speed. If you are on the lookout for wider shoes, the Dream Pairs is excellent for you. If your feet is somehow narrow, order half a size so a pair will fit perfectly to your feet. Moreover, the Dream Pairs has a premium, DP combination upper. Therefore, you are given maximum comfort and durability. Its rotational traction configuration allows your feet to be firmly planted and stable on the ground. 1. If you have wide feet, read our best soccer cleats for wide feet selection. 2. You can also checkout our complete list of best soccer cleats. 3. You probably need socks too, read our best soccer socks selection.